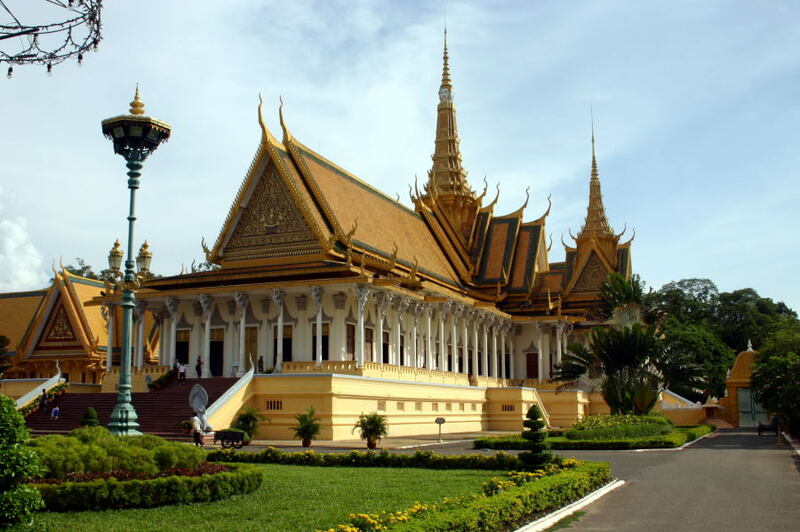 Phnom Penh's Royal Palace sits facing the river on Sothearos Boulevard. The palace itself is only about 100 years old, although the site has been used by Khmer royalty going back to the early fifteenth century. As you approach the palace, the most notable feature on the outside is the large open pavilion built onto the outer wall. Although it appears to be a reviewing stand to allow the royal family to view events or speak to the people, according to all descriptions, the pavilion is actually used for moonlit dance performances. A short way along the outer wall from the dancing pavilion is the large Victory Gate, traditionally used only by the royal family. We commoners enter the palace grounds through a gate further along the wall to the south of the Victory Gate. The first major building you pass is the open-sided banqueting hall formally known as Preah Tineang Phochani. Continuing down the path will bring you past the inside of the Victory Gate and then close to the Dancing Pavilion. The palace grounds are closed to visitors just north of the Dancing Pavilion, so although you can see it, you can't enter the pavilion. Turning left (west), you'll be facing the group of buildings anchored by the grand Throne Hall, the Preah Tineang Tevea Vinicchay. To the right of the Throne Hall is a small pavilion called Hor Samranphirum. The building is used as a Royal Waiting Room on coronation day, when the King and Queen are waiting for their elephants to be bought around. You'll note a door and some posts on one side of the building used to harness the elephants while the royals board. While the exterior of the Throne Hall is an exquisite example of pure Southeast Asian Buddhist architecture, the interior mixes Asian and European decoration. The window shutters are painted red with gold stenciling, in typical Asian style, while the ceiling frescoes wouldn't be out of place in a European palace. At the very back of the Throne Hall is a large gilded altar, in front of which is a high gilded coronation throne, topped by a nine tiered parasol. In front of the throne are a set of more western styled chairs, which apparently are used by the King and Queen for most state occasions, rather than the high throne. South of the Throne Hall are two other interesting building. The first is the traditionally styled Royal Treasury, the Hor Samritvimean. The tall, narrow pavilion houses the coronation regalia, including the crown, a sacred sword and the Victory Spear. The lower floor contains a small display room where you can see some of the more minor royal regalia and utensils. Next to the treasury is the curious Pavilion of Napoleon III. You could probably figure this out without being told, given the very French styling of the building and the big letter "N"etched on all the windows. The building was built of cast-iron, which must make it frightfully hot in the tropical weather. It was originally used by the Empress Eugenie for the inauguration of the Suez Canal in 1869, then presented to King Norodom by Napoleon in 1876. Behind the pavilion is the offices of the Royal Palace. 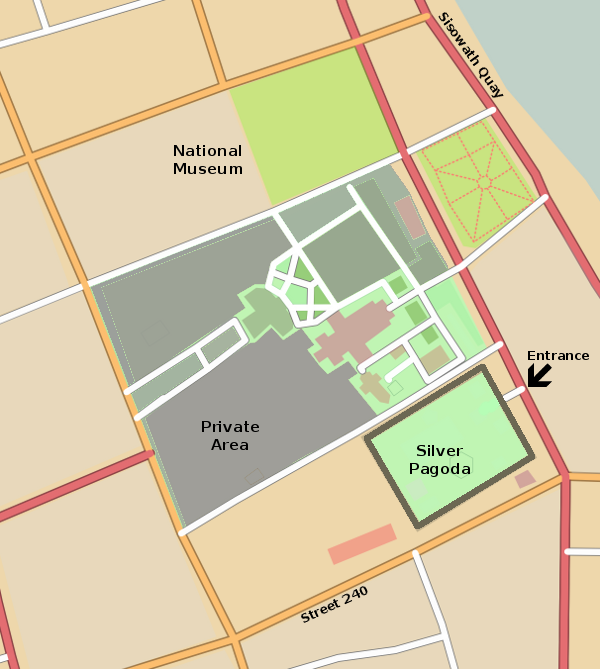 Just past the Napoleon Pavilion, a gateway provides access to the Silver Pagoda. 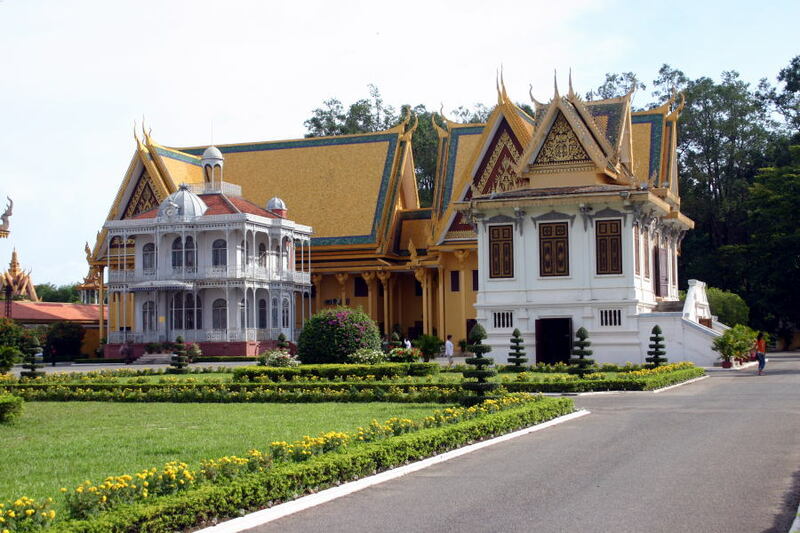 Phnom Penh's Royal Palace is open daily from 7:30 to 11:00 and 14:00 to 17:00. All or part of the palace may be closed for special events. The basic entry fee is US$3. You must pay an additional US$2 to use a still camera or US$5 for a video camera. Note that in any case, no photography is allowed inside any of the buildings. Since the palace and all the structures within face east, the best time to visit is in the early morning hours.